Group classes provide the perfect environment for learning new behaviors and proofing established behavior. Your dog will have a chance to learn, and practice, self-control even in the presence of other dogs and people and help develop your dog’s social skills. Group classes help you learn to work with your dog to keep their attention in a new place and with distractions. Classes will be at 1220 Weil Street, suite #4, Billings, MT 59101. Classes will only have between 5-6 dogs to ensure quality training. Listed below is a description of all classes. Please note, that not all classes are offered at the same time. ​Find updated class schedule below the descriptions. ​If any questions or special requests, please don't hesitate to call at (406) 679-3826. When working with our dogs, we will use the marker word "yes". Using a marker word helps give them instant and clear feedback, when they are performing the wanted behavior. Before coming to class, please watch this video ﻿"How to charge your marker word" and start this exercise at home. Before coming to class, please start teaching your dog to "settle/relax om mat" (see this video). This is not a "go to mat" exercise, but instead simply teaching the dog that the mat is an awesome place, where great things (food, bones, stuffed Kong) will happen when he/she lays down to relax. Bring mat/towel to class. This is where your dog will "settle/relax", while in class. Bring bully stick, stuffed Kong or bone to class. This will help your dog to settle in class. Bring 3-4 different types of treats. Example: Kibble (low value), soft training treats (medium value) and boiled chicken or hot-dogs (high value) , all cut into pea-sized treats. And bring lots of them! Only flat buckle collar or harness allowed on dog in class. No exception! Keep your dog on leash at all time. When walking in and out of class, keep distance. Don't let your dog walk up to another dog on a leash! IF for some reason your dog does get close to another dog on a leash, let them sniff each other on a loose leash for max 3 seconds and then call your dog to follow you - using "happy" voice (not a tight leash). Please no flip-flops or high heels. It is important that you can move freely and comfortably in your foot wear. Make sure to have lots of fun - Park Ego outside ! What you teach (or neglect to teach) your pup during his first year of life will determine what kind of a dog he grows into. So come and join us for a fun 6 week puppy class with focus on proper socialization, relationship between dog and handler, attention, impulse control as well as sit, down , stay, leave it and drop it cues, recall and much more, all to help give you and your puppy the best start together. WE DO NOT ACCEPT PUPPIES THAT GO TO DOG PARKS! It is a safety and health concern. UPDATE APRIL 2018: If you have a newly adopted dog from a rescue in the Billings area or one of the Reservation Rescues, you will need to have a health clearance for parvo/distemper before attending one of our classes or privates or play groups." The CGC Program is a great obedience foundation for all dogs, designed to reward dogs who have good manners at home and in the community. The Canine Good Citizen Program is a two-part program that stresses responsible pet ownership for owners and basic good manners for dogs. In this class we will work on the 10-step requirements to pass the CGC test. All dogs who pass the 10-step CGC test may receive a certificate from the American Kennel Club. The test will be scheduled at a separate date for anyone interested in participation. Rally is a fun dog sport in which the dog and handler complete a course at their own pace through a course of designated stations (10 - 20, depending on the level). Each of these stations has a sign providing instructions regarding the next skill that is to be performed. This Intro Class will focus on the Novice signs and the importance of encouragement and teamwork. All dogs are welcome, no matter their age or breed. Requirement: Absolutely no reactive dogs allowed! If your dog is reactive, consider private sessions instead to work on that specific issue. This fun class is a great foundation class for Rally, Rally-FrEe or Freestyle dancing. We will work on transitional moves, such as spins, circle around, through legs with focus on precision in positioning and transferal of behaviors to verbal cues. This is a more technical class utilizing luring, shaping and target training. Requirement: Must already have basic walking skills, and have a desire to take training beyond sit, down and stay. In this class we will continue to work on new creative moves as well as working on creating small sequences with the moves we already know with a focus on improving flow. We will add music and really explore each individual team's style. In this class we will focus on our clicker mechanical skills and how we can utilize a clicker when teaching our dogs new tricks , by gradually mark and reward wanted behaviors but in smaller incremental steps. Shaping can be a great way to teach some difficult behaviors, expand your animal’s capabilities, exercise your animal’s brain, and build your handler and communication skills. In this class, we will work with our dogs both indoor and outdoor. The outdoor work will take place in different locations in Billings. In this class we will practice settle, loose leash walk, stay, focus, proper greeting behavior and much more with the focus on creating stronger, reliable behaviors even with added distractions, thus making it a more enjoyable experience for you and your dog when going for walks. Requirements: Dog does need to have basic commands. No reactive dogs allowed. In this 4 weeks class, we will focus on building drive and commitment. A fun intro class to get started on Nose work and a great way to mentally exhaust your dog. This new Mix Match class will focus on a different dog activity in each session. Topics will range from Rally, Nose work, Balance and Conditioning work, Creative Movements, Tricks and Enrichment Puzzles to RallyFree. This class is a chance for the handler to try some new activities beyond basic manners and is suitable for any dog, no matter age, breed or activity level. Come and try something new and have a fun time with your dog. Note: No reactive dogs allowed. If your dog is reactive, consider private sessions instead to help work with your dog on this specific issue. New class schedule is ready. 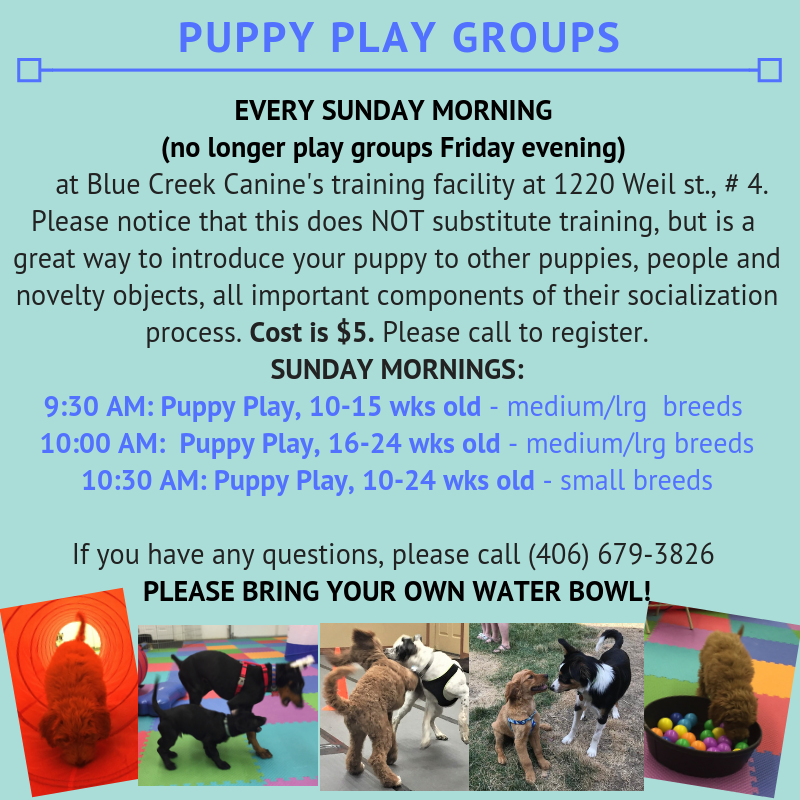 ​We no longer accept puppies that go to dog parks or other off leash areas during this developmental phase. It is often bad play styles and dangerous for puppies to be mixing with an adult off leash population, and it also increases the risk of your new puppy attracting a petri dish of germs and bacteria and vira, that we don't care to partake in. Thank you for respecting this. ​and recommend classes for you and your dog based on your specific needs.